Aardmore Greens is situated in perfect golfing country with a wealth of excellent courses and is a wonderful destination for the golf enthusiast. The Garden Route's fantastic scenery, moderate climate and famous hospitality make it ideal for spending time out on the fairways under the bright African sun. Golfers here are truly blessed for choice and if you enjoy the challenge of a coastal course, there is a stunning selection available. Fancourt offers three originally designed Gary Player golf courses - including The Links, which Gary Player has often referred to as his greatest design feat. The Links, Montagu & Outeniqua golf courses are all ranked in the Top 20 in South Africa. The Links is listed in 30th place by the Golf Digest magazine (US Conde Nast publication) in their Top 100 courses outside of the US. Since opening in the early 90's with just 27 Gary Player-designed holes, Fancourt's Outeniqua and Montagu golf courses have matured and developed into two of the finest 18-hole parkland layouts in the country. A round on either is a special experience, sculpted and finished as they are, with rare attention to detail and designed with the coastal George winds in mind. The Links at Fancourt was added in 2000, an awe-inspiring example of magnificent design and golf-course construction, about which designer Gary Player says: "I feel a genuine affinity for Fancourt and it is the home of perhaps my greatest achievement as a golf course designer." Rob O'Friell Golf Course Architect extraordinaire, fresh from his successes at River Club and Royal Johannesburg was given carte blanche to upgrade the design of greens and surrounds at Plettenberg Bay Country Club. During the contract his farsighted recommendations on certain water features and ponds were also implemented. 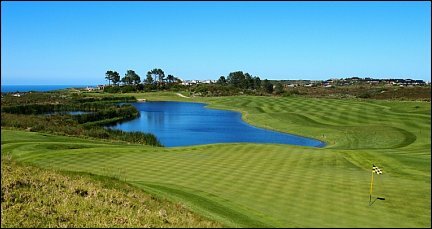 Plettenberg Bay Country Club has an 18 hole parklands golf course set in a private nature reserve and this highly rated course is a very popular tourist destination. The course is easy to walk, and the 2 main inclines can be observed from the veranda and visitors are welcome. Lush Kikuyu grass fairways and bayview greens recently over seeded to bent grass provides golfers with an excellent playing surface on this park like golf course. Despite intense competition from the beautiful white beaches and rolling surf, the club is busy and booking is essential. This is no 'little seaside golf course', all greens and bunkers are to USGA specifications. All greens and fairways are on automatic sprinkler systems - the result is a golf course you will remember. The natural beauty of the course has been carefully retained and the Parkland Course is mainly populated with indigenous flora and fauna. It has no intrusive houses or traffic noise and vervet monkeys, baboons, birdlife like the Knysna Loerie and woodpeckers as well as the occasional bushbuck and deer are more likely to distract you from your game. Keeping your head down at Simola can be a challenge, simply because the views around the course are awe-enspiring, and with this, it is clear to see why Simola takes its place as one of South Africa's premier golfing destinations. It's also the first Jack Nicklaus Signature course on the Garden Route, reflecting the maestro's philosophy of attuning the layout and design to the natural lie of the land. The course offers challenging and rewarding golf amidst the spectacular scenery. Set below the high ridges, it's free from the wind that so often plagues coastal courses. Fairways flow with the natural undulating contours of the terrain and the unusual configuration of five par 5's and five par 3's adds a new dimension to the game. It's par for the course that every hole boasts exceptional views, either out across the Knysna Lagoon all the way to the Heads, or over the picturesque Knysna River as it twists and turns through the valley below. The Goose Valley Golf Club is situated in pristine surroundings, only 4km from Plettenberg Bay, bordering on the Keurbooms Lagoon and offers a splendid Gary Player designed 72 par, 18-hole signature golf course in the heart of the Garden Route. The unique siting of the golf course on a sand dune allows for easy draining of the course and provides the perfect base for year round play, even after heavy rains on tees and greens. An excellent blend of indigenous and coniferous trees complements the picturesque views and water features to provide a challenge to golfers of all abilities. The golfing experience is further enhanced by a state-of-the-art driving range with practice chipping, putting and bunker play facilities. Pezula Championship Golf Course is located in the Western Cape of South Africa in the picturesque town of Knysna, the jewel of the world famous Garden Route. This stunningly beautiful golf course is a sweeping spectacle of fairways and greens rolling through the pristine Southern Cape landscape. In 2001, just a few months after it opened, the course was awarded Best New Golf Course in South Africa by the Golf Digest and Compleat Golfer has rated Pezula Championship Course a Five Star Golf Experience every year since February 2005. Golf lessons are available from the Club's PGA Professionals. 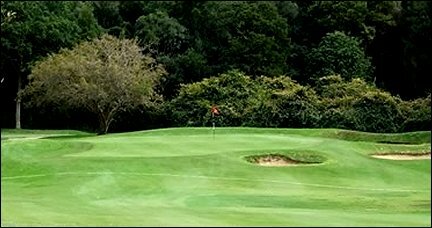 The Knysna Golf Course is an enjoyable and gentle stroll through tree-lined fairways and you will not experience the fatigue you might on the more testing courses in the region. The surrounding hills and mountains provide scenic backdrops and there is a great variety of trees, flowers and bird-life to watch out for. The newly rebuilt clubhouse has a pleasant halfway house with a welcoming bar and deck of substantial proportions. The atmosphere is friendly and relaxing, so enjoy! The course measures 5,799 metres off the men's tees and 5,031 metres off the ladies' tees. It plays to a par of 72 with a South African Golf Union rating of 70. We enjoy greens which are highly receptive, with a constantly smooth putting surface all year round and together with an attractive and potentially hazardous water feature as a backdrop, shapely and well manicured bunkers protecting the green add to what is now a substantial finishing challenge. 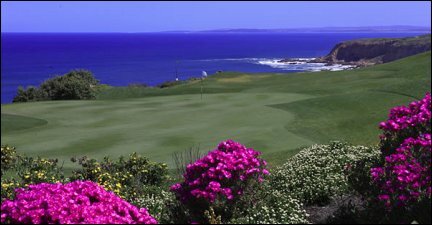 The Pinnacle Point Golf Course is something truly unique for the discerning golfer. This 18 hole championship golf course was deigned by the well-known South African golf course architect Peter Matkovich who opened the course together with Top Irish Tour Golf Professional Darren Clarke in November 2006. Darren Clarke, who was also involved with many aspects of the Pinnacle Point course design, has said Pinnacle Point is "... the best golf course on the planet." Pinnacle Point was selected as one of the Top Ten New Golf Courses of the World for 2006 by the American publication Travel and Leisure in January 2007. This Cliff top Fynbos Golf Course inspires the golfer to play this challenging layout with a level of respect due to its dramatic views and breathtaking terrain. The 72 par layout is characterised by 7 majestic holes that line the Indian Ocean rock cliffs, 4 of which are played over ocean and cliff. All of the 18 holes have been designed to fit the lay of the land and it's a true testament to the spectacular design that this was achieved.